If you’ve been a fan or customer (we have a particular fondness for the later :)) of Retro 51 pens for a while, then you’ve surely seen our Tornado Pop Series. But what you may not be familiar with is the story behind these uniquely designed pens. Beginning in the spring of 2008, we thought it would be a great idea to create a seasonal themed pen, in addition to our more traditional Tornado collections. As a maker of fine writing instruments we not only want to make high-quality pens and pencils, but to also design writing instruments that push the boundaries of themes and stylistic appeal. And the Pop Series provided us with a unique opportunity to do just that- using the latest trends, retro fun, and new production techniques. Our first POP Series (see above) was spring-inspired and featured the Bocks Green, Torsion Pink, and Coil Yellow Tornado. That same summer we created our second Series, which had a tropical flair and included: Tropical Paradise, Route 66, and Waikiki. And we closed out our first year of the Series with the winter themed Skiing Tornado. Due to the overwhelming response and popular demand, the designs for our POP Series quickly morphed into fashion forward, artistic, and even pop culture themes. The Series now features designs ranging from the eye-popping Yipes to the glow-in-the-dark Zap! But one characteristic remains the same. 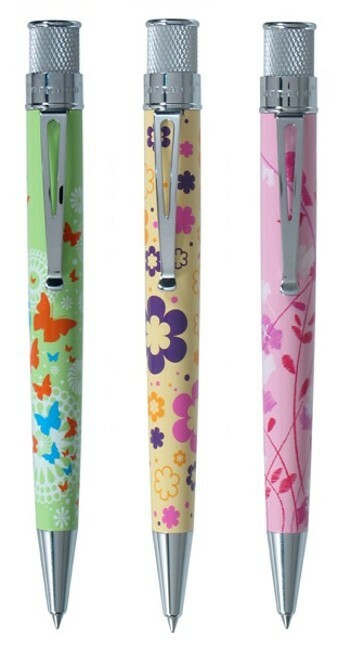 All Tornado POP Series pens are limited editions. For each release we only make 500 pens (With the exception of Yipes and the Summer 2008 series, for which we made 1000 pieces. And the Zap, of which we made 525 ). So if you see a POP you love, don’t hesitate to grab it. High-tail it to your local retailer ASAP! Because once they’re gone, they’re gone! Do you own a Tornado POP? Which one is your favorite? Did you miss out on one you really want? Leave us your feedback on our Fan Page. We love hearing from you! To find a retailer near you, please visit our website. I live in saint Louis mo, and was wondering how much refills would cost for my tornado pen? All the ones I have are dried out. I have passed your question and email onto our customer service and they will help you find some refills.